Gabrielle Zilkha is an award-winning film director and producer with experience in scripted, documentary, multi-media and interactive storytelling. Raised in a funny and neurotic family from Montreal, Gabrielle’s approach to writing and directing combines humour, fearless imagination and insightful commentary about the world we live in. 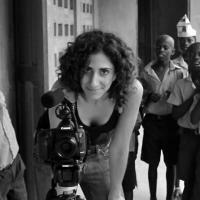 Her films and transmedia projects have been screened and exhibited around the globe and covered by media outlets such as CBC Radio, The Globe and Mail, TO Grid and Canadian Jewish News as well as popular digital publications like Indiewire. Most recently, her short film STOP CALLING ME HONEY BUNNY was shortlisted for the Iris Prize, the world’s most prestigious LGBT short film award and has gone on to win audience and jury awards around the globe. Gabrielle’s career has always married creativity, humour and a healthy dose of social responsibility. In 2009 she co-founded The Spotlight Project, a production company that produces arts and entertainment tied to a social mission. With The Spotlight Project, Gabrielle produced, directed and wrote the unique interactive documentary video installation, I WORRY, in 2011 which received acclaim from local critics and journalists. Part social experiment, part documentary film, I WORRY asked a cross-section of 100 people in Toronto to list the five things they worry about most. The film examined the responses for themes and insights and connected the personal act of worrying with larger social, political, economic and philosophical dilemmas of our times. Prior to obtaining her Hon. BA in Equity Studies and English from the University of Toronto, Gabrielle studied theatre at Dawson College in Montreal.